For most women is an important tool in their everyday beauty arsenal. From eyeliners, to lipsticks, to blushers there’s a huge number of makeup products that can help make us feel better about ourselves. We use makeup to enhance or change the way we look, hide our imperfections, and feel more confident. Don’t be confused by the thousands of products on the cosmetic shelves. From eyelash curlers to eyeliners, there are so many makeup tools on the market that it can be tough to figure out exactly what you need in your make up essentials. We have to find the perfect shades and a product that will suit our skin tone perfectly. A part of the reason why we use also is also because it becomes a style statement and completes every look. An outfit looks perfect and complete with a perfectly done face with right colors and undertones. The first step of makeup after you prep your skin should be foundation. This evens out your skin tone and gives it a flawless look. While choosing a foundation you should keep your skin type in mind because there is a variety of foundations. You should also decide what you want your foundation to do for you as it starts from a full coverage to medium and light. Foundations or moose for daily wear can preferably be lighter especially in summer. Press powders or compact settles your foundation and your base so that its gives a oil free touch. Find the perfect shade for your skin tone so that it does not look patchy on your skin. Press powders brightens ups your skin and leaves a light and glow on your skin. 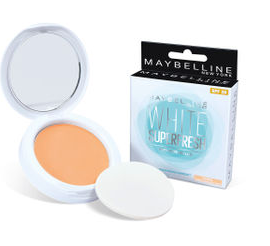 Maybelline New York White Super Fresh has UV filters that protect skin from both sun darkening and damage. Helps you stay 12 Hr Fair, Fresh and absorbs oil . Gives a naturally perfect-looking complexion. Contains SPF 28 to protect your skin. Suitable for everyday use .Keeps your complexion looking fresh for 12 hours and feels perfect all day long even in hot, humid weather. Who doesn’t like rosy cheeks? It takes your look from dull to bright in a second. Different outfits have different shades ad the make up also should match them. There are different types of blush, starting from shimmer to matte. 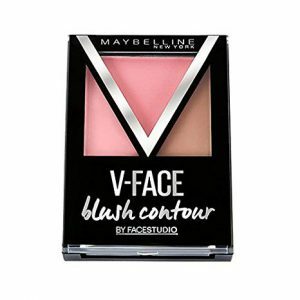 Maybelline New York presents a stunning V-face Blush Contour by Face Studio that makes it easy to define, shape and highlight your features like a pro. An all-in-one contouring and face sculpting powder blush, this gives dimension to your face with its color-coordinated blush, contouring shade and highlighter, Maybelline V-face Blush Contour can be used to get a rosy blush look, that adds a subtle contour with a rosy satin finish. Easily bendable with intense pigmentation. Gives a smooth, satin finish. Mascara is the game changer. Your eyes just don’t look as good without it in your make up essentials. Out of everything in your makeup bag. Mascara can be used in so many different ways, and the products out there literally do it all. Thanks to advanced curling wands and richly colored hues, you can basically toss out your lash curlers and base coats. The Lakme Eyeconic Curling Mascara is a unique mascara that lets you play with dramatic eye looks, by giving you intensely curled lashes. The smart curl brush allows smooth strokes for perfectly curled lashes. 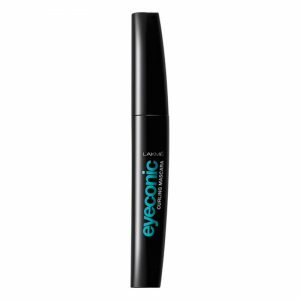 This product glides on your eyes and give it as very elegant yet dramatic look. Even on those days when everything is dull and gloomy a perfect lip color changes the game. A whole range of shades that is never ending for the one who like subtle to the ones who likes bold. Nudes, Pinks, Reds and all the colors you need to match each one of your outfit. NYX Professional Makeup Presents striking matte finish lipsticks and waterproof, which glide on smooth and perfectly and are available in wide range of vibrant shades and colour. Swipe on your favorite creamy colour , highly pigmented and lasting soft matte. Pick your personal favorite from varied super matte, glossy or creamy finish NYX Professional Makeup Lipsticks and Lip glosses in bold and neutral colors suitable for all skin types.